If you like Italian cuisine and either live in Los Angeles or plan on taking a trip there, then this is a restaurant you must get to know. 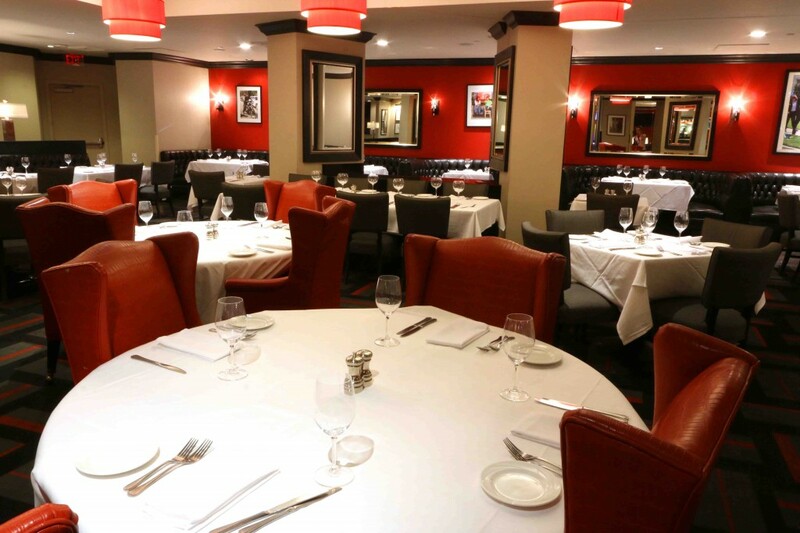 Currently ranked #10 best Italian restaurant in Los Angeles, Paparazzi Ristorante is a gem. 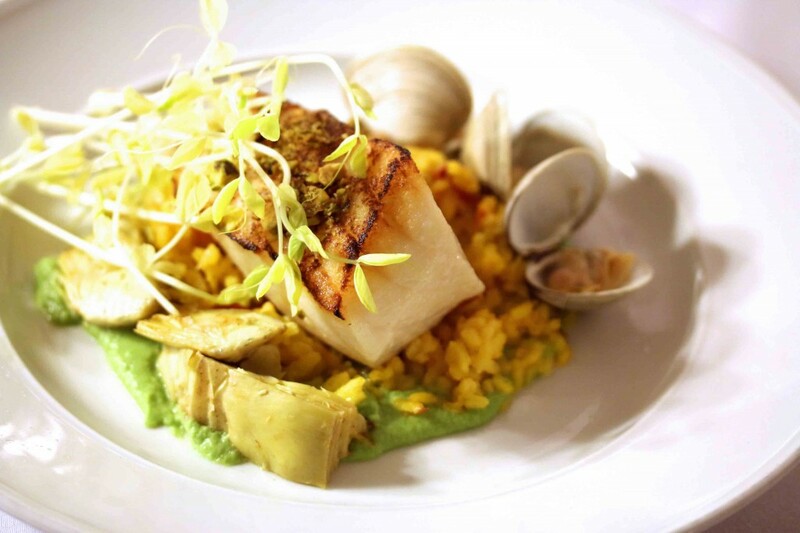 Each dish uses the finest ingredients that are thoughtfully and creatively prepared into a masterpiece. It’s no surprise that it has earned such accolades and we look forward to seeing Paparazzi continue to climb the ranks of Los Angeles’ best restaurants. I was able to sneak into the restaurant to snap a few pictures before the dinner crowd arrived. 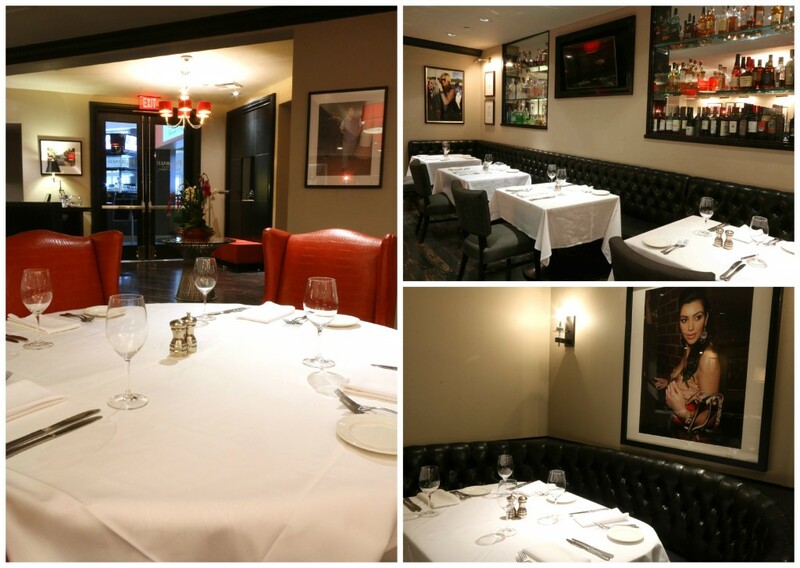 Come join us for a virtual tour of Paparazzi Ristorante and it’s heavenly food! Paparazzi is hidden inside the Sheraton Gateway Hotel. Don’t let the fact that it’s located inside of a hotel stop you. You can get your parking validated in the restaurant and from however far you’re traveling, an evening at Paparazzi is worth it. We would gladly make a trip from across town to dine here. We recently stayed at the Sheraton Gateway (full article to come). 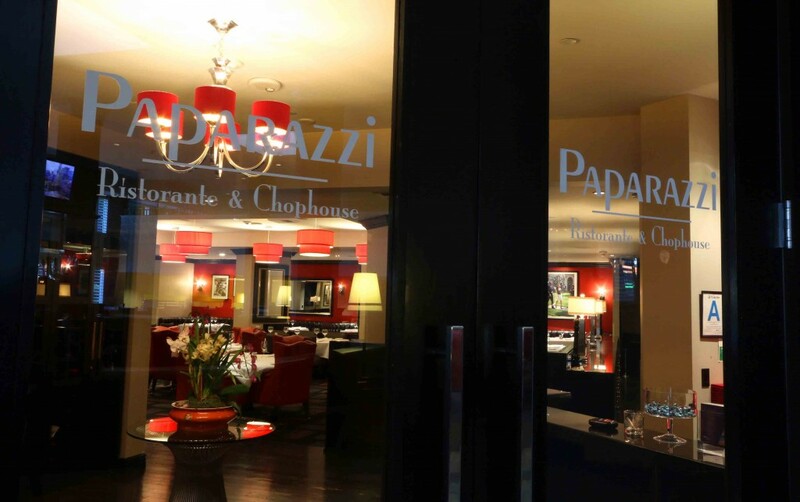 When we first checked in at the front desk I casually mentioned that we were looking forward to dining at Paparazzi based on what we had already heard about it. The hotel staff’s face practically lit up as she spoke about their highly-acclaimed restaurant: “We’re very proud of our restaurant,” she said almost beaming. We witnessed this same pride among the restaurant staff, most of whom I had the privilege of meeting. All were friendly, professional, gracious and offered to do everything they could to ensure we had the best experience. Dinner at Paparazzi Ristorante was the highlight of our stay. Come take a look. Enter Paparazzi. The front foyer is warm and welcoming. Immediately to the right is the entrance to the dining area. 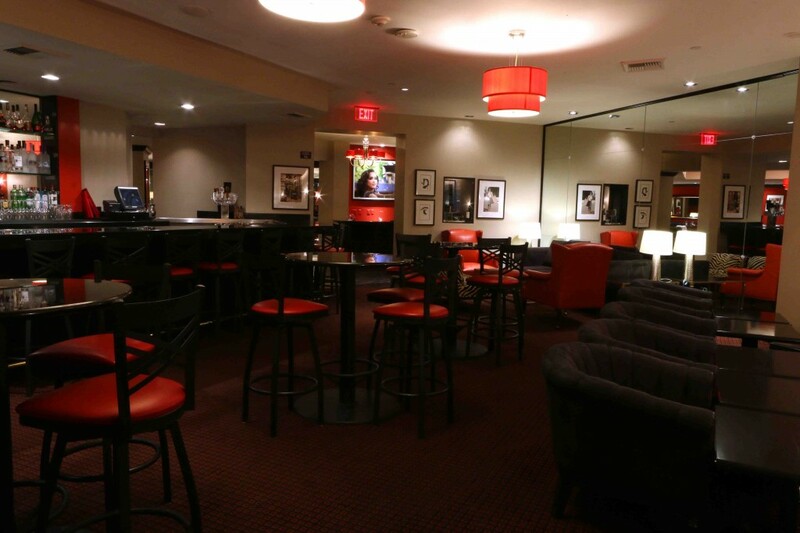 To the left is the bar and lounge. Let’s bear left first. 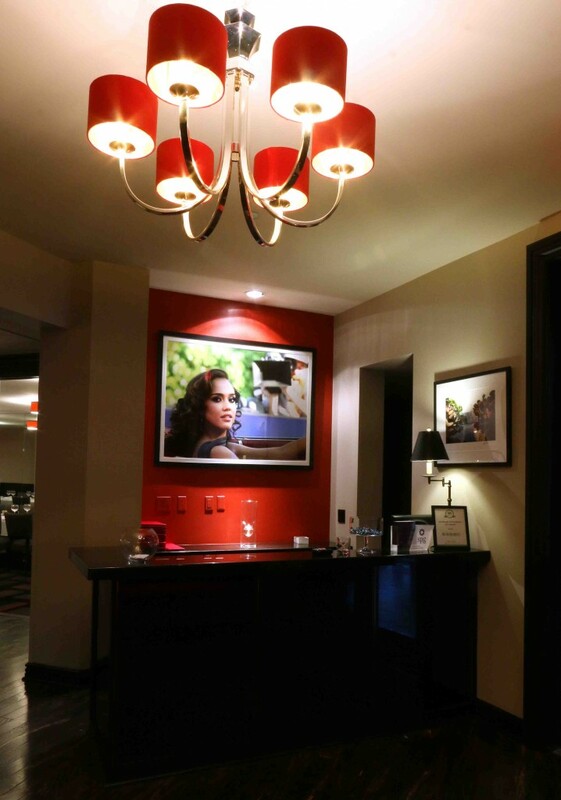 The color scheme is consistent throughout the restaurant and bar/lounge with the same photographic theme of candid celebrity snapshots. 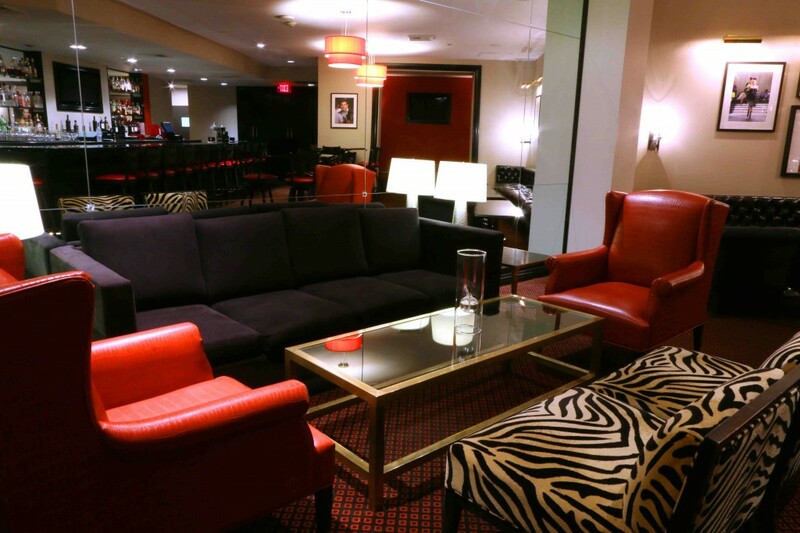 The lighting is soft and there is plenty of comfortable seating. Let’s head back to the front foyer and into the dining area. Dark woods, vibrant reds and cheerful lighting create a cozy, classy, romantic atmosphere. The restaurant is well-lit, a welcome change, though the lighting is still soft and flattering. Paparazzi obviously understands that those who appreciate good food dine with their eyes as well as their mouths and we appreciated the ability of enjoying the visual beauty and styling of our food. Juxtaposed against the dark woods and reds, the white tablecloths look especially pristine. The glasses and silverware shimmer and the faces of notable individuals look on behind frames of glass. 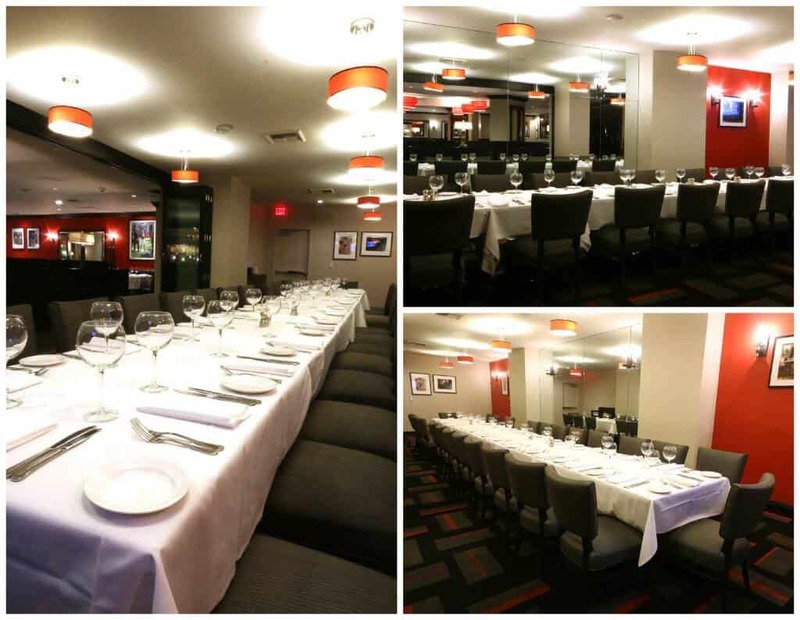 Several private dining options are available and they provide privacy while still offering views into the main area of the restaurant. Paparazzi’s decor is clean, crisp, and classy. 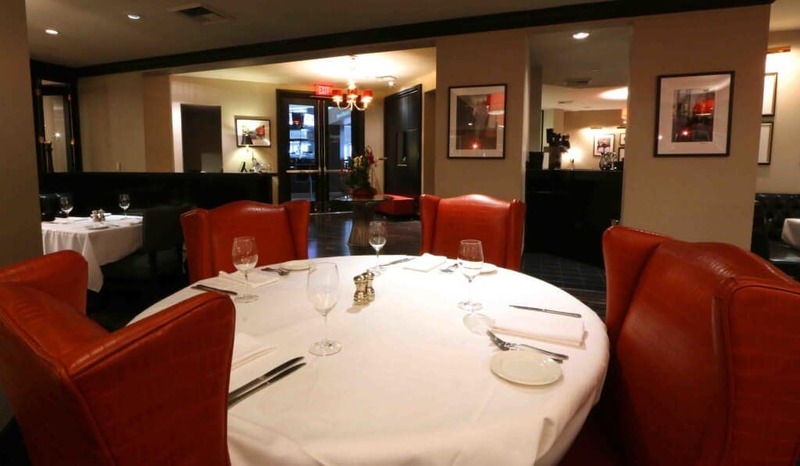 The atmosphere is upscale and elegant without being overly pretentious or intimidating. It’s cozy and we immediately felt comfortable. The service was stellar and our waiter was very knowledgeable. The shared pride and passion among the management and staff is apparent in every aspect of the restaurant, in everything from the carefully pressed and crisp white tablecloths, the place settings, the immaculate cleanliness, the tasteful decor, and of course the food. And on that note, let’s talk about the FOOD! This dishes were thoughtfully prepared and creatively executed, showcasing the highest quality ingredients in an aesthetically beautiful way. This formula was apparent in each dish we tried. 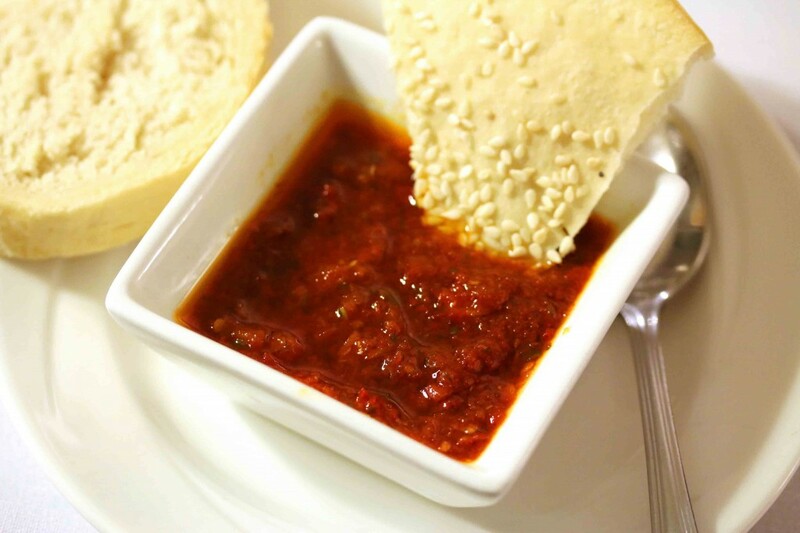 While we waited for our appetizers we enjoyed some tapenade with sun-dried tomatoes and garlic. It was like a sun-ripened flavor bomb exploding in our mouths with such force that it penetrated every taste bud. Marvelous. 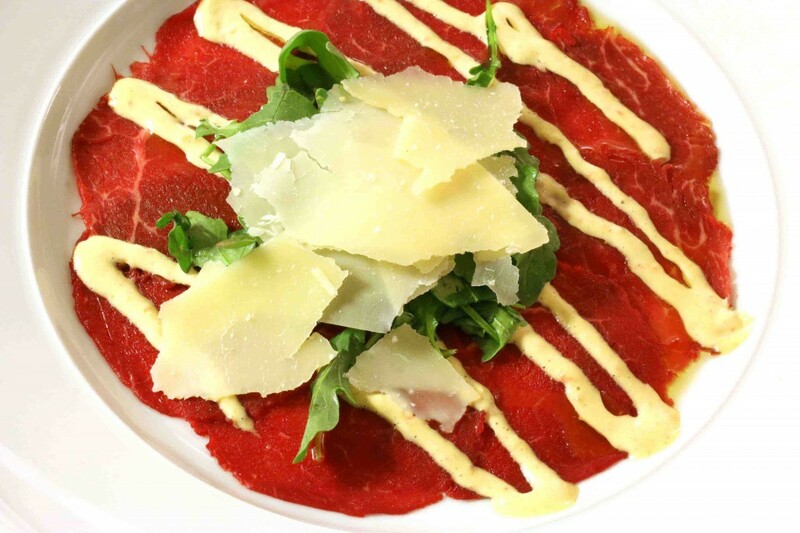 To start, Todd ordered the Carpaccio Di Filetto, Rucola & Grana, thinly sliced beef filet mignon topped with arugula, grana padano cheese and Dijon mustard sauce. The tenderness of the beef, crispiness of the spicy arugula, chewiness of the savory grana padano, and the creamy mustard sauce was an excellent combination. 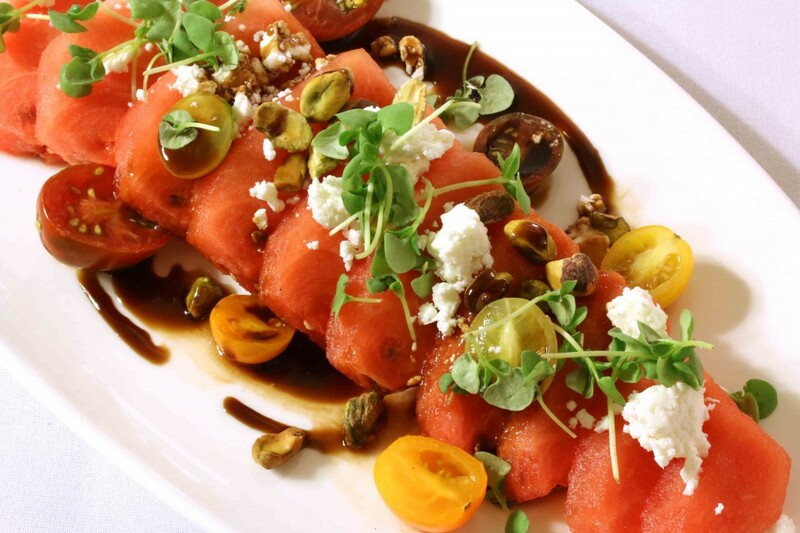 I ordered the Cocomero salad, a delicious combination of sweet watermelon, goat cheese, watercress, cherry tomatoes, pistachio nuts and a balsamic reduction. I slowly savored each bite and marveled at how these few simple ingredients, so thoughtfully and masterfully combined, created a dish that was so enjoyable I didn’t want it to end. This dish exemplifies the magical chemistry that occurs when just the right ingredients are brought together. This delightful salad far exceeded my expectations and I’ve been craving it ever since. It was outstanding. Eventually I finished the last bite and watched forlornly as my empty plate was carried away. Fortunately, something equally wonderful followed. But first, my husband’s entree. Todd tried the Merluzzo Cileno Al Pistacchio, a pistachio-crusted Chilean sea bass with clams, roasted tomato-saffron risotto, English pea emulsion, fiesole artichokes, and pea shoots. Just look at it. Simply beautiful. The fresh pea emulsion was light as air and its fresh, mild flavor added a nice touch to the seafood. The zesty tomato-saffron risotto complemented the other flavors well and the artichokes and pea shoots were a classy touch. I ordered the Garganelli con Salsiccia and I thought I had died and gone to culinary heaven. 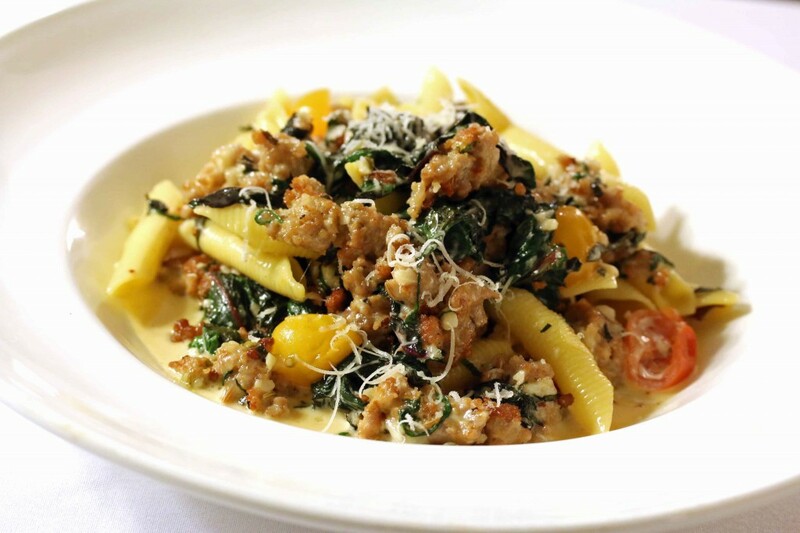 Hand-rolled pasta with Italian sausage, parmigiana cream sauce, Swiss chard and cherry tomatoes. The flavors were so rich and vibrant, they had my taste buds completely captivated. My husband was equally wowed. If I lived in the area, this is a dish I would come back for again and again. Along with that Cocomero salad. Yes, in response to the classic question “if you had to eat the same thing every day for…”, the Cocomero and Garganelli would be ideal. So true. And so we ordered and split a serving of refreshing strawberry gelato and the Vulcano al Cioccolato, a warm chocolate lava cake, pot de crème, and pistachio gelato with biscotti crumble. As the saying goes, the perfect ending to a perfect meal. Our meal was over and we did leave the restaurant that night with one major regret: That we only had one evening to enjoy Paparazzi before heading out of town. There were so many other dishes we wanted to try. Paparazzi has raised the bar for me. It is among the finest Italian cuisine we’ve had. 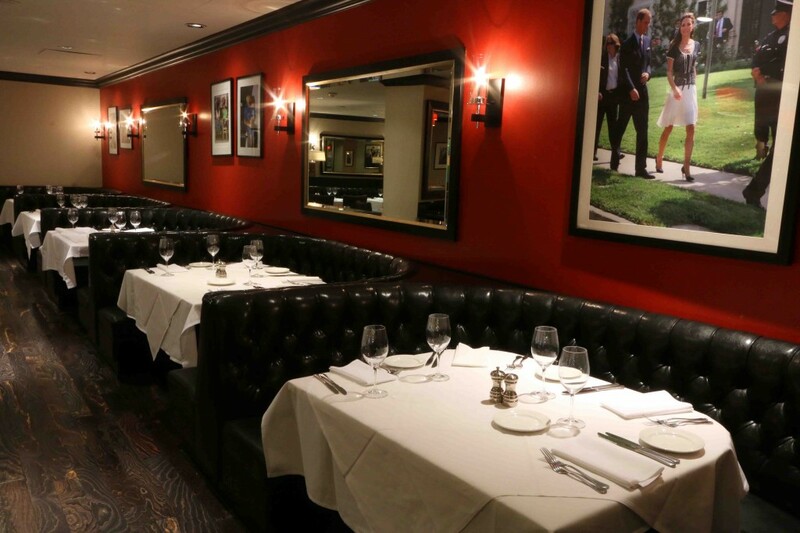 The next time we are in Los Angeles and visit Paparazzi (you can be sure we will), I already know which entree I’m trying next: The Lasagna Al Brasato – lasagna stuffed with braised beef short ribs, fresh ricotta, spinach and parmigiana in bechamel sauce. Can you just imagine?? And my husband doesn’t know it yet but he’ll be ordering the Osso Buco. *sigh* If only I had a private jet that could fly me there at will. Paparazzi has had a strange effect on me. On the one hand I want to tell the world all about it. Yet on the other hand I want to keep the discovery all to myself. But, as you can see, in the end I went with the more altruistic option. And so here is my shout-out to the world: “COME TO PAPARAZZI!” and experience some of the best Southern Italian-inspired food you’ve eaten. Disclosure: Paparazzi hosted us for the evening but all opinions, as always, are entirely my own. Yum! This looks amazing! I’m on the east coast but next time I’m out in LA I will def stop by. And that short rib lasagna sounds delicious. I’ll have to try it too! YuM! You’ll be glad you did, Travelpanties. I know, I can’t wait to try that short rib lasagna! I really like the “feel” of this place, the colors and style. That food seriously looks amazing, the way you’ve described it and the pictures. Just beautiful and I can only imagine how delicious it is. My husband and I regularly visit LA as our oldest daughter and grandkids live there. Looking forward to trying Paparazzi. Thank you for such a beautiful and informative review. The food and atmosphere were wonderful, Corinne, I’m sure you’ll both enjoy it! Have fun! Italian food is my absolute favorite and this looks genuine. I’m pretty scrutinizing of Italian restaurants and it’s not often that I find one that impresses me. Your pictures and descriptions have convinced me to give this one a try the next time I’m in the area. That cocomero salad sounds fantastic. Osso buco has always been a personal favorite (when it’s made right) but I really want to try that short rib lasagna. Great review, thanks! The cocomero salad was amazing, Nathan! I know, I can’t wait to try that short rib lasagna, either. After dinner I was really wishing I had a second stomach so I could have tried it! It looks so warm and inviting. Plus, the food looks delicious. If I ever find myself in Los Angeles I will be sure to try it out. Those dishes look fabulous. I will be including this on my list of places to visit. You’ll be glad you did, Vincent! I live here in LA and have never heard of Paparazzi! So looks like we have a new place to check out! I like the decor and color of the restaurant and the food looks delectable. Oh, and I do agree with that ancient Chinese proverb, by the way! Thanks for letting us know about Paparazzi! WOW! The atmosphere looks amazing. Super modern and classy. But the food. Omgggg. Every picture looks delicious! That salad is fantastic. I get to LA a couple of times a year and usually end up at the Sheraton Universal. I’m going to have to find the Sheraton Gateway and check out this restaurant! Wonderful review!! That salad looks AMAZING!! 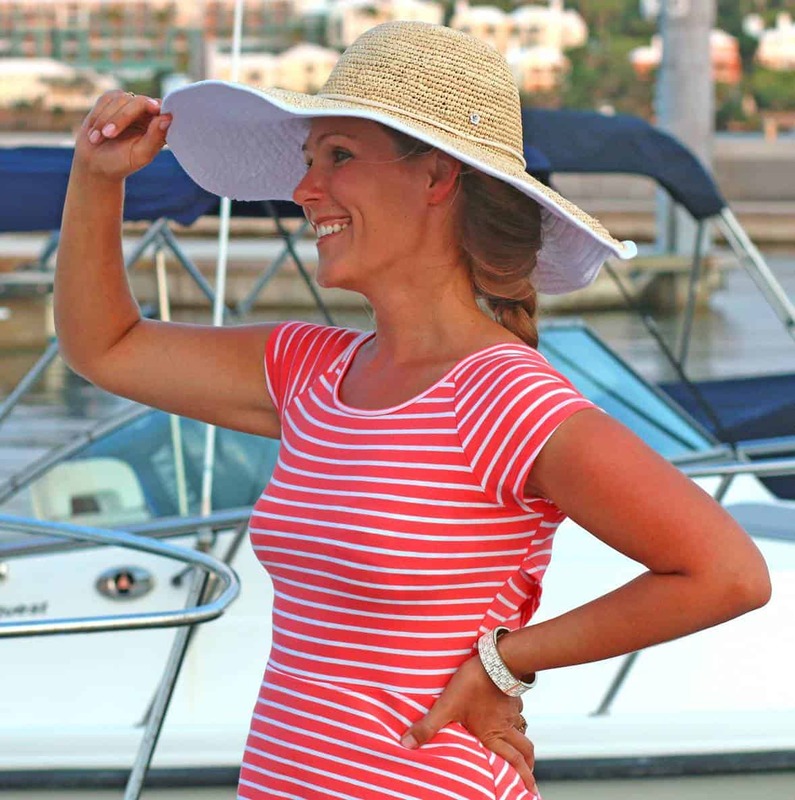 Thanks, Keri, it’s always a privilege to post reviews on exceptionally great places. You’re very welcome, Cori, and when you go save a chair for me because I’ll be there in spirit! Food looks great!!! And I love the interior. Seems very old school Hollywood yet not dated.